Despised and splendid, great, defamed. ‘The Face of Suffrage’ celebrates the centenary of women over 30 gaining the right to vote in the UK and is composed of thousands of photographs tessellated to create a giant portrait of suffragist Hilda Burkitt (1876-1955). Yet to take Hilda at face value based upon this one image is misleading as it belies a story of militant suffrage that is, in many ways, at odds with the ladylike demeanour presented in the portrait. Hilda was born in Wolverhampton and joined the Birmingham branch of the Women’s Social and Political Union in 1907. Two years later, she was convicted of wilfully damaging a railway carriage by throwing a stone and breaking a window in the last carriage of Prime Minister Herbert Asquith’s train as it pulled out of Birmingham New Street station on his return from a usual men-only budget meeting in the city. She was sentenced to one month’s imprisonment and became the first suffragette to be force fed—in total, a staggering 292 times whilst incarcerated. The tension between Hilda’s benign appearance in this public artwork and her militancy also highlights tensions that existed within the struggle for women’s suffrage. She used direct action believing that the means justified the ends. This included damaging property and committing arson, but not when it could harm people. However, questions relating to the moral acceptability of these actions continue to divide opinion—not all women suffragist agreed on the use of direct action, nor did all these women come from the same class or educational background. In many ways Hilda’s life choices made her an outsider as she defied many of the social conventions of her time. Throughout her activism, Hilda was single and although she later married, becoming Mrs Mitchener, she separated and never had children. ‘The Face of Suffrage’ is an intensely personal project conceived of by The People’s Picture, an art and design studio headed up by visual artist, Helen Marshall, in partnership with key local organisations and backed with Arts Council funding. Not only are there countless narratives embedded within more than 3,700 portraits of women, girls, and those identifying as female or non-binary, but there are also text submissions relating to those who are the subject of each image. Bridging past and present, the individual images provide a snapshot of the history of photography via one its most ubiquitous genres—portraiture. Historical archive images shot on analogue sit alongside digital images captured with mobile phones, many of which are selfies, while black-and-white portraits merge with colour images. Helen has even included a photograph, adding to thousands of little secrets waiting to be unearthed. Burkitt’s portrait was taken in 1901 by Hilda’s sister, Lillian, who ran The Warwick Art Company photography studio and brings another dimension to work in the context of women and photography—this is not a woman viewed through the lens of a male gaze but a woman photographed by another woman. Perhaps this is why Hilda seems to connect with the viewer; she makes eye contact and has a slight smile, making her appearance feel less austere than many portraits of the time. The technique used by the artist and the floor display of the work on the station’s concourse recalls the Roman mosaic technique, opus tessellatum, a once highly valued art form that was used to create decorative floors in both private and public spaces. All the images are crowd-sourced and reproduced as photographic elements in two sizes, sections of which have been repeated as patterns to form a single face. Using an open submission policy that gives exposure to thousands of personal images, the crowd-sourcing of the components is a socially engaged and collaborative production process that is intense and painstaking. This multi-layered approach uses digital algorithms and relies on a small, dedicated team to create a vast public artwork in which the journey to create the portrait is as vital as the final outcome. As the public walk through Birmingham New Street station in the 21stcentury, they will be traversing the face of Hilda and following in her footsteps of more than a century before. This beautifully realised work is unashamedly multi-authored and celebrates inclusivity, a key aim of The People’s Picture. The spirit of the train station is intrinsically linked to the work as thousands of images congregate to form a mosaic that collapses boundaries between art and life. 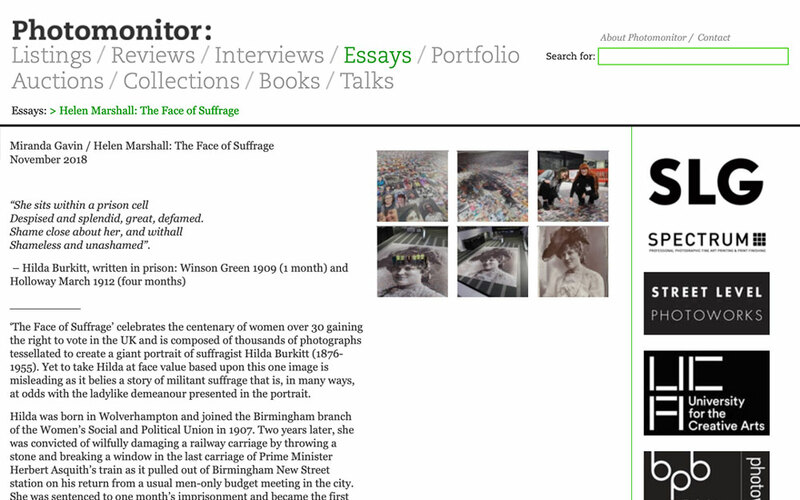 The specificity of the urban geographical environment, a democratic space where people from all strata of society pass through, and its emotional connection to Hilda’s history and the Birmingham suffragettes playfully creates further layers of meaning. Hilda Burkitt’s portrait is placed in response to the architecture of the station and its display along the horizontal axis of the floor is unusual. As with the face of Hilda, this site-specific installation is ephemeral and at odds with many artistic and social conventions in terms of both subject and exhibition, and could also be read as an embodiment of grass roots politics.